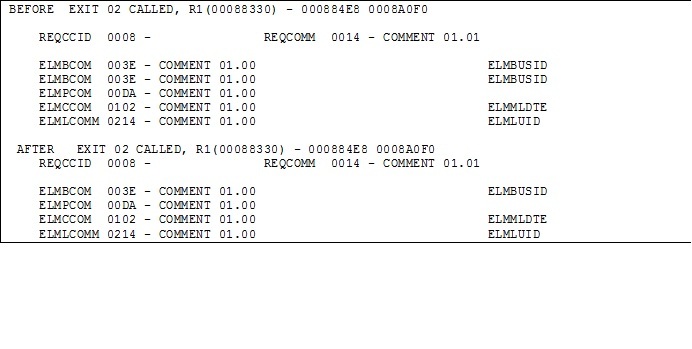 Commenting on COMMENTS – "in-approval"
The following case study is an investigation I conducted on the manner in which COMMENTS are reflected in the MCF of Endevor. It serves to illustrate that there’s much more to Endevor than meets the eye! 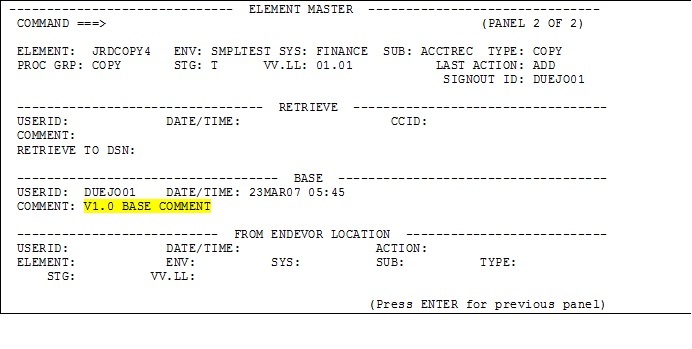 The customer is making use of EXIT02 in order to cause special processing to take place when an element is being promoted or otherwise worked on and the COMMENT contains the word “EMERGENCY”. When there is no source change to the element, the customer has determined that the COMMENT field does not contain the comment they had entered into Endevor. Instead, the previous comment (or “level” comment) is the only one seen by the exit program. This is resulting in the customer having to make a “dummy” change to the source for the sole purpose of having the “EMERGENCY” word be contained in the COMMENT field for the exit. 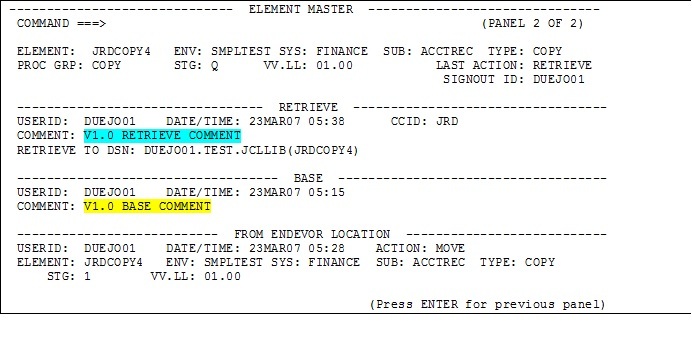 Note the highlighting done in the Element Master displays; Endevor has replicated the comment across 5 different areas. These are 5 distinct and unique areas within Endevor that contain comments and are not the same field. 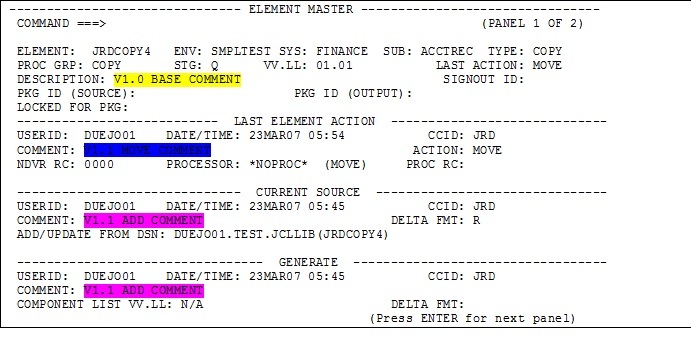 Each field displays what it contains at different times in Endevor. In this instance, because we have only done one (1) thing, there is only one comment to display. 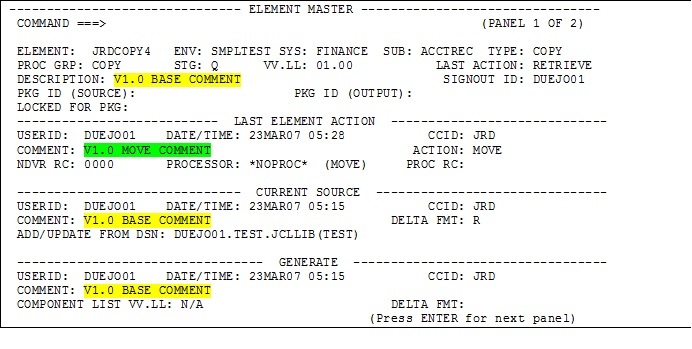 Note that the comment that changed is NOT the comment that was associated to the element when I created it; rather, the comment is associated with a unique comment field in the MCF that contains comments associated to the last action done. 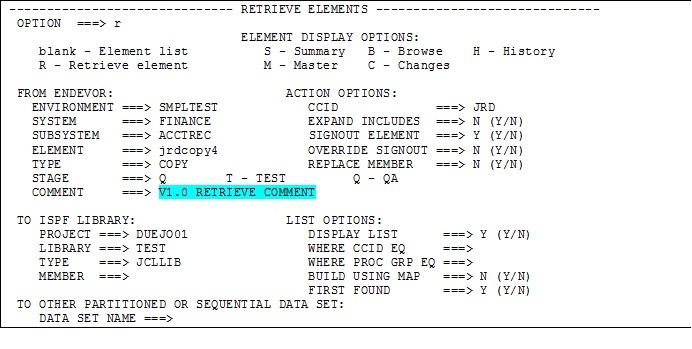 For the RETRIEVE action, there is a specific comment field area in the MCF that contains the information and it has been updated with the RETRIEVE COMMENT accordingly. 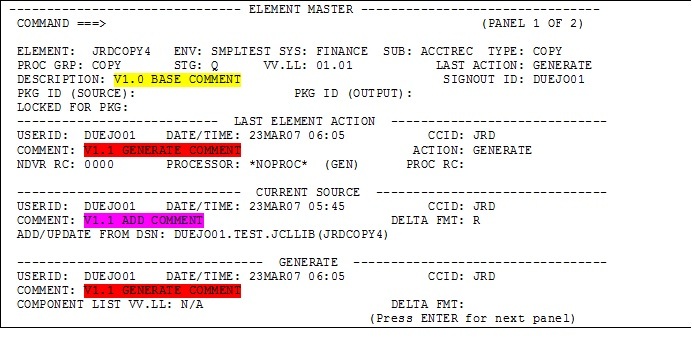 The MCF associated to the element now contains the following in THIS stage (note that the MCF information in the next (target) stage still contains the original comments as indicated in figures 8 and 9). Note that these are the comments associated to the element at this location where the changes have been made. The RETRIEVE comment is blank because this is NOT where I did my RETRIEVE! This is Stage “T” and, if you will review figures 7, 8 and 9, you will see that the RETRIEVE that I did was at Stage “Q”. Several things are important to note at this stage. The BASE comments never change. 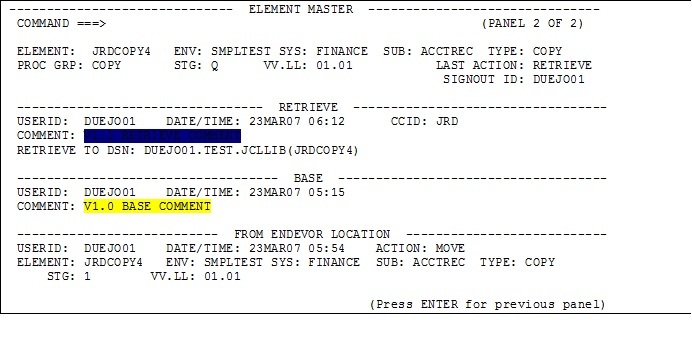 They will always reflect the original comment that was placed into Endevor when the element was first created. The RETRIEVE comment has now been dropped from stage “Q” MCF. This is because we have now moved back to the original place that I did my RETRIEVE. The CURRENT SOURCE comment reflects the comments associated with the change. 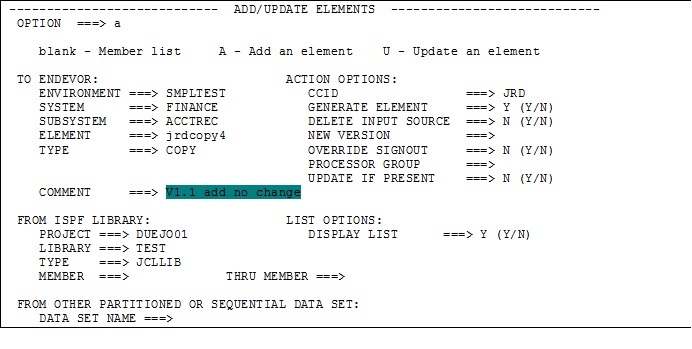 This is the field that is updated when a change is detected in the actual source lines of the program. The LAST ELEMENT ACTION comment reflects the comment associated to the last action executed, in this situation “MOVE”. 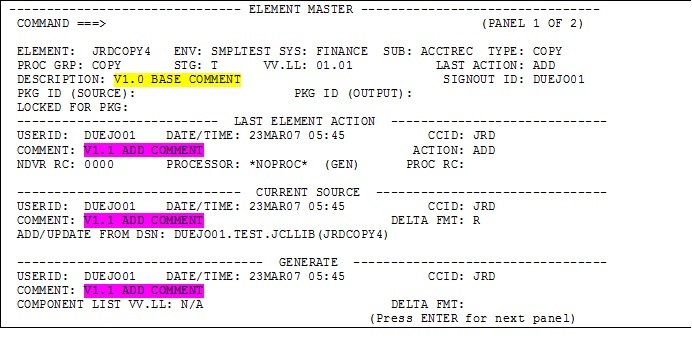 The GENERATE comment reflects the same as the CURRENT SOURCE comment because I have not done any additional “generate” aside from the one that is done automatically when you “add/update” an element. To re-iterate, the comment associated to a change is the “CURRENT SOURCE” comment. 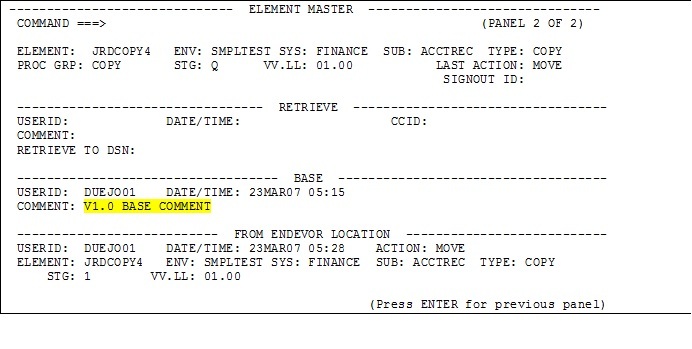 The comment associated to activity or actions taking place in Endevor is the “LAST ELEMENT ACTION” comment. 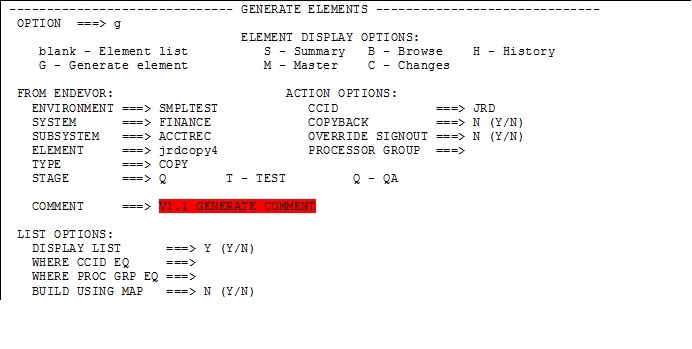 In the customer’s scenario, they have an element for which no changes to the element are detected. To recreate the scenario, I begin by retrieving the element again. As I would expect, only the RETRIEVE comment has been changed. Note the message in the top-right corner “NO CHANGES DETECTED”. If I query the MCF, the following information shows where the comment was contained. This is the exact result I would hope Endevor would contain as the comments are in the correct place and Endevor is ensuring the wrong comments are not associated to the wrong things. The BASE comment remains as originally coded. The CURRENT SOURCE comment has not changed and should not change because the source did not change. This comment field, based on what Endevor does, should only change if the source itself changes. There results are exactly what I would expect. Each comment is contained in its appropriate area. Endevor is maintaining the integrity of the right comment to the right action. Since we have established that Endevor is maintaining comments for the right things in the right places, the next thing to investigate is what is available to each of the exits during processing. In the case of the customer having this problem, the exit being invoked is EXIT02. EXIT02 is invoked by Endevor before executing any actions. In other words, in Endevor, this exit is passed information before Endevor has actually done anything. All source is still where it is and no movement (for example) has begun. 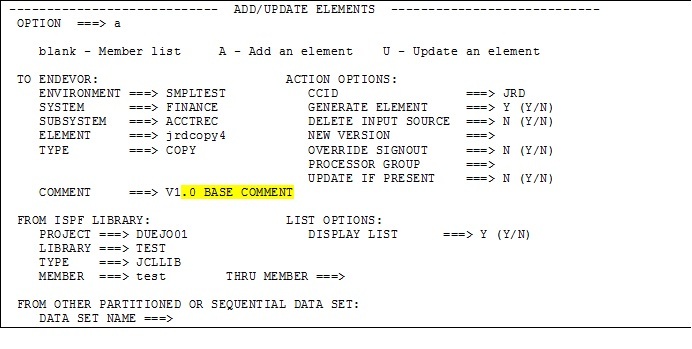 Based on understanding how, when and where Endevor stores comments, this trace makes complete sense. The source comments (as reflected in the ELM* fields) does not change because the source has not changed. This is correct. 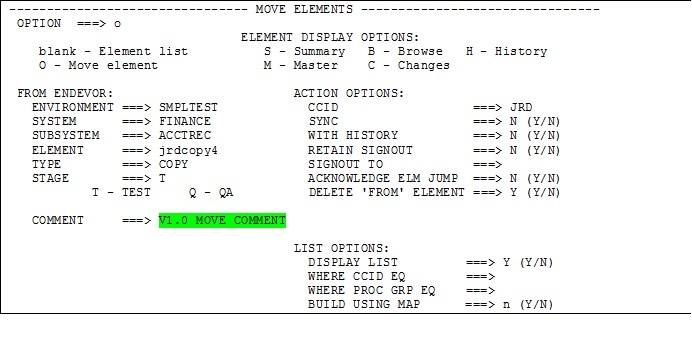 The REQCOMM comment, which reflects the comment associated to the action being done, correctly shows the comment associated to the action that is being requested. The solution to the problem the customer is having is actually very simple although does require a change to their exit program. The problem is that the exit program is looking at the wrong comment field for the wrong reason. 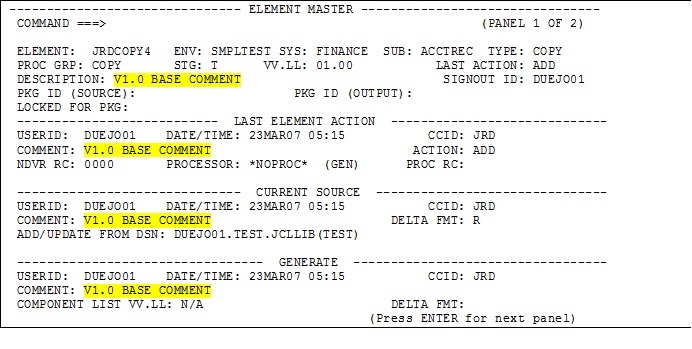 The comment field being looked at by the program is likely the “CURRENT SOURCE” comment. 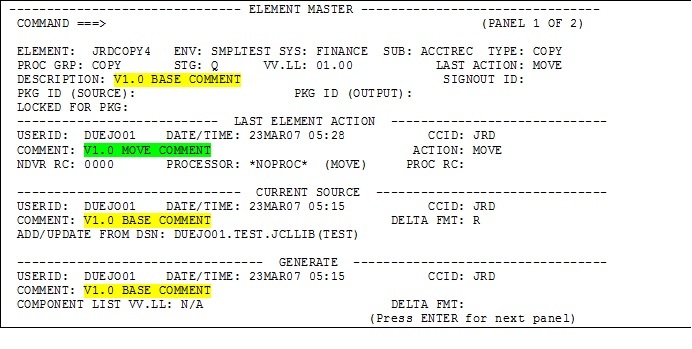 The comment field the program SHOULD be looking at is for activity that is taking place against the element. 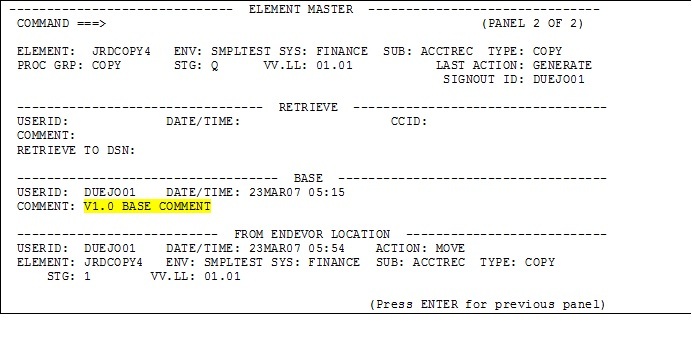 This field will always contain the comment to trigger the event such as EMERGENCY that the client is looking for since it always contains the comment regardless of whether there are source changes or not. 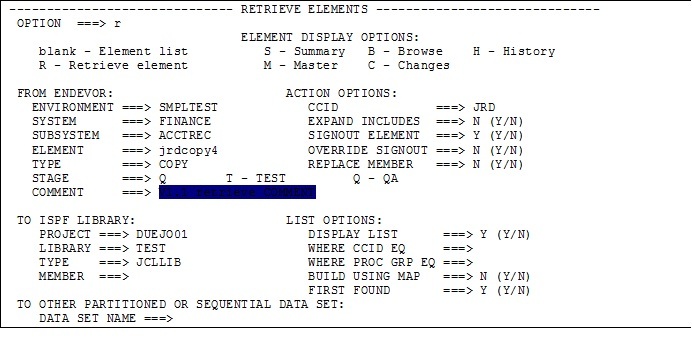 Simply put, the program must be modified to look at field REQCOMM (if written in Assembler) or REQ-COMMENT (if written in COBOL) and not look at any of the ELM* fields for the “EMERGENCY” word. This is the only change required by the customer to ensure their solutions keeps working as designed. No change is required in Endevor.